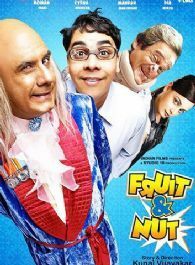 Fruit and Nut is a madcap comedy with a central character named Jolly Maker, who is a simple, hard working middle class struggling bachelor in search of love, money, friends and success. Jolly Maker works as a clerk/accountant in office of a greedy and corrupt builder named Khandar. He is typically nerdy and un-stylish. He is also accident-prone and leaves a trail of disaster behind him.